In order to create a meaningful table, you need to measure something. For example, using the sample Retail Banking dataset, you can choose to measure a simple count of customers, or you can generate a table that calculates something more complex, such as the mean customer profit or the median account balance. In many cases, the underlying data you will be working with in SuperWEB2 comes from multiple tables connected by relationships. 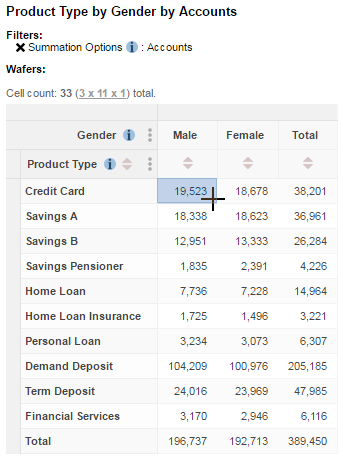 For example, the sample Retail Banking dataset contains two connected tables: customer records and account records. 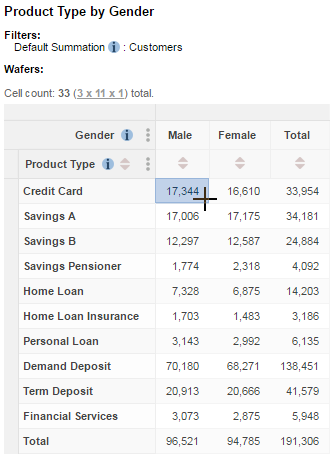 The following example table shows the Product Type field (from the Accounts table) against the Gender field (from the Customers table). The default summation (a count of the number of customers) has been applied; you can see this by checking the details in the Filters. 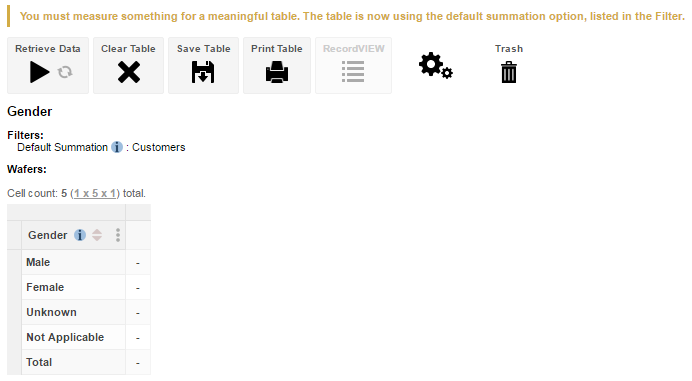 The available summation options are shown at the top of the tree in the customise table panel. 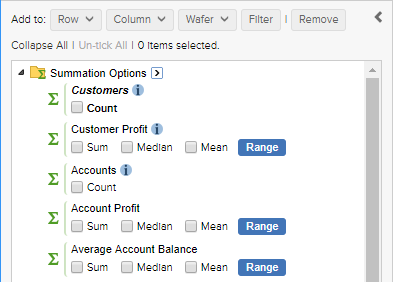 Select an option and then click Add to Row, Column, Filter or Wafer to add it to the table. Count - a count of the number of records. Mathematical operations, such as sum, median and mean. 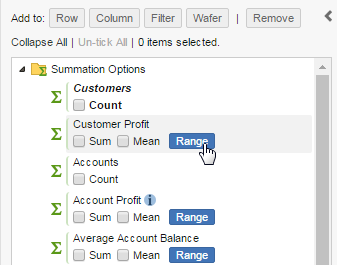 Range - this option allows you to add quantiles or create custom ranges. 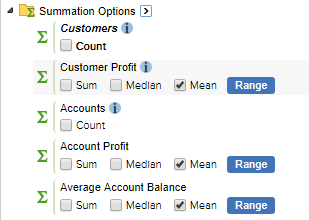 Mean and median are only available if your system has been configured to enable these statistical functions. 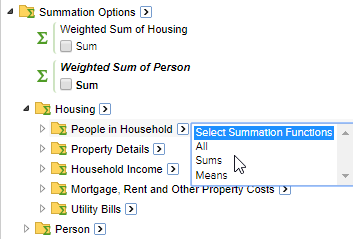 You can use the select arrow and drop-down list to quickly select all summation options, or to quickly select all summation options of a particular type (for example, all the counts, or all means). Click the arrow next to Summation Options. When your summation options are organised into folders, there will be a select arrow next to each level of the hierarchy. Using the option at a particular level will select all the matching summation options from that level and any others below it in the hierarchy. For example, the following dataset has summation options for Housing and Person level measures. 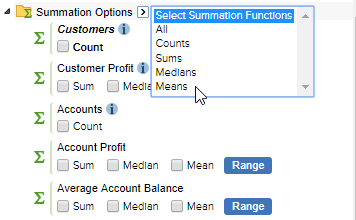 If you choose Select Sums at the top level, this will select every available Sum measure. However, if you choose Select Sums from the People in Household level it will only select the ones at that level and below in the hierarchy.